The Superstore had bunches of beets with their greens for $2.50 this week. Or was it $2.00... I can’t quite remember. Regardless, I grabbed 2 bunches. Buying beets with greens attached is a great way to buy two vegetables for the price of one. Why people cut off the greens and toss them is just beyond me. What do people think – they're poison? I like beets (both greens and roots), even though many people say beets taste like “dirt.” That’s a common complaint about many root vegetables, but beets in particular. That’s a real shame, because they’re pretty darn good for you. Beets are sort of nature’s candy. Beets are very high in sugar and iron, as well as many other vitamins, minerals and healthful compounds. If you want to enhance the natural sugars roast them. Beets have been cultivated as food since at least 2,000 BCE. They are a staple of many European countries and the star performer in such classic dishes as borscht. They can be served raw, boiled or roasted. They are pickled and/or spiced. In fact, beets are not uncommon as a side dish in Indian cuisine. They are also a favourite in the American south, where it is believed the standard pickled beets we know today originated. Beets are highly nutritious and good for cardiovascular health. Beets are a unique source of phytonutrients called betalains. 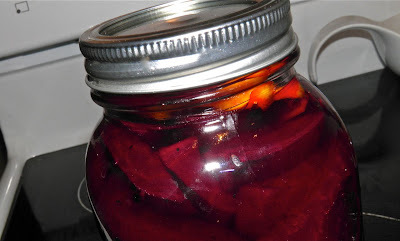 Betanin and vulgaxanthin are the two best-studied betalains from beets. Both have been shown to provide antioxidant, anti-inflammatory, and detoxification support as well as anti-ageing supports. Why do you pee red after eating beets? Classify this information under “fun fact of the day.” It’s called beeturia. Beeturia is the passing of red or pink urine after eating beets or other foods that contain the beet pigment. The colour is caused by the excretion of the beet’s betalain pigments such as betanin. This phenomenon is not the same for everyone. Some people pass a strongly pigmented urine, while it has no (or nearly no) effect on others. The urine colouring depends on unique stomach acidity and the length of time in the stomach. It can also colour your feces. 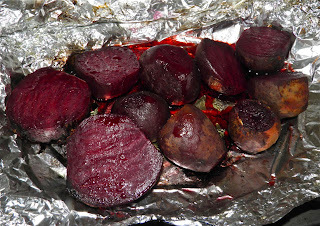 Roasting beets not only enhances the sugars before pickling, but also adds a depth of flavour and mitigates that “dirt” taste so many dislike. Of course, some orange rind and cloves don’t hurt either! The number of beets you need will vary because of the size so keep that in mind when purchasing. Wash the beets well. Trim off the beet root end and any top leaf attachment. Try to then cut the beets into relatively the same size. Smaller beets can be left whole. Place in foil, seal well and roast for about 1 hour at 450°F. Let cool until they can be handled. Bring the sugar, vinegar, water, rind and cloves to a rolling boil. Pour the liquid over the beets in the jars, leaving about 1/2 inch headspace. Seal the jars and let sit on the counter until cooled. The lids will snap down in the centre, proving they are sealed. If you are the least bit uncomfortable about that, you can process in a hot water bath for 10 minutes and then let cool. Sealed beets will last for well over a year on the shelf. For best flavour let the pickling soak into the beets for a few days. 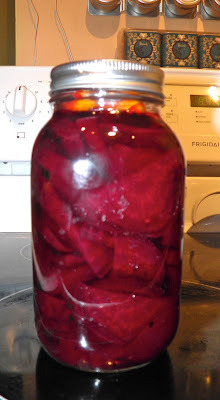 Thanks for the great info and recipe for beets. They are my favourite veggie and I can't wait to try this recipe! You're very welcome. Always glad to share good food. Hope you enjoy them!